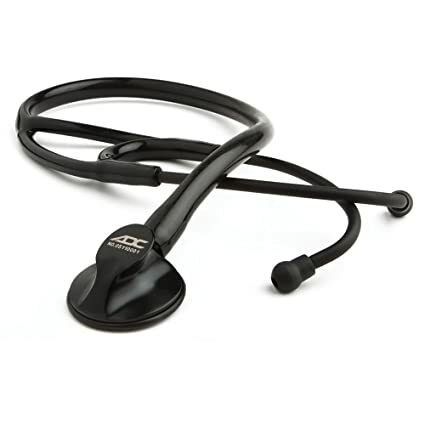 The ADC Adscope 601 Convertible Cardiology Stethoscope with AFD Technology is our most versatile cardiology scope. The convertible chestpiece provides adult diaphragm/bell or adult/pediatric diaphragm configurations. Use light pressure for low, bell-type frequencies, and firm pressure for high, diaphragm-type frequencies, or switch to the extra deep bell for unsurpassed low-frequency response. Featuring a bi-lumen (dual channel) headset design for improved stereo separation, the Adscope 601 offers outstanding performance, comfort, and durability. Your Adscope 601 comes with a scope ID tag and two additional pairs of Adsoft Plus eartips in a convenient storage case. Select a tactical finish with black tubing or a stainless finish with one of nine tubing colors. The ADC Adscope 600 Cardiology Stethoscope with AFD Technology combines the acoustic response of a traditional bell and diaphragm in a convenient one-sided chestpiece. Use light pressure for low, bell-type frequencies, and firm pressure for high, diaphragm-type frequencies. Featuring a bi-lumen (dual channel) headset design for improved stereo separation, the Adscope 600 offers outstanding performance, comfort, and durability. Your Adscope 600 comes with a scope ID tag and two additional pairs of Adsoft Plus eartips in a convenient storage case. Select from three metal finishes – stainless, tactical, or titanium gold plated – and up to nine tubing colors, depending on the finish. The adscope 615 platinum professional is our best multi-frequency scope today. it combines the acoustic response of a traditional bell and diaphragm into a convenient one-sided chestpiece. 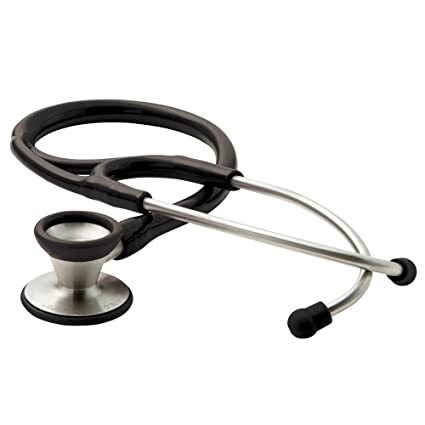 ADSCOPE Convertible Cardiology Stethoscope combines versatility with outstanding acoustic performance. Combination diaphragm/bell chest piece. Pediatric Diaphragm attachment. Stainless steel construction. Bi-lumen (two tube in one) design for improved stereo separation. ADSOFT threaded ear tips for the ultimate in wearing comfort. Spare diaphragms and assortment of ear tips. The adscope 655 vistascope has our unique chestpiece design with 8 interchangable designer diaphragms that provide up to twice the amplification of ordinary acoustic scopes. 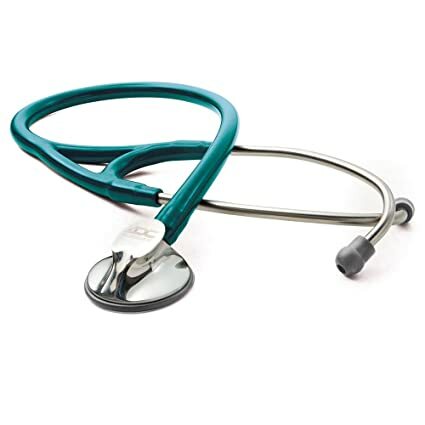 The ADC Adscope 602 Traditional Cardiology Stethoscope blends precision-crafted performance with rugged durability. The combination chestpiece offers both an ultra-sensitive diaphragm for greater amplification and crisper high-frequency transmission as well as an extra-deep bell for unsurpassed low-frequency response. The bi-lumen (dual channel) headset is designed for improved stereo separation, with large-bore stainless steel binaurals fixed at an ergonomic 15 angle for the ultimate in wearing comfort and acoustic seal. 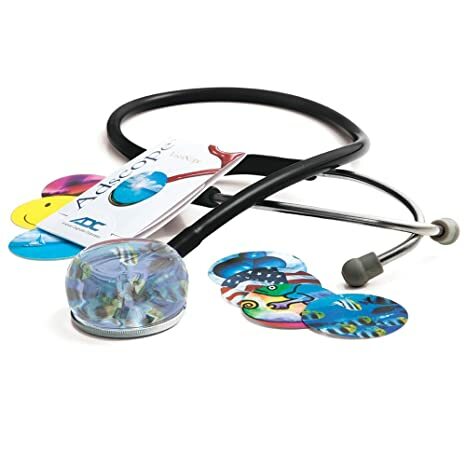 Your Adscope 602 comes with a spare diaphragm, a scope ID tag, and two additional pairs of Adsoft Plus eartips in a convenient storage case. Select one of three tubing colors: black, burgundy, or dark green. 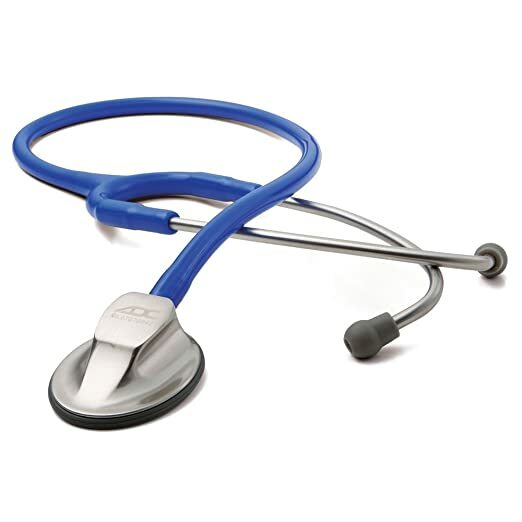 The ADC Adscope 600 Cardiology Stethoscope with AFD Technology combines the acoustic response of a traditional bell and diaphragm in a convenient one-sided chestpiece. 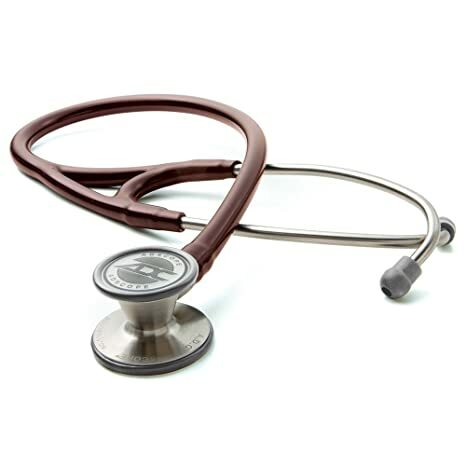 Use light pressure for low, bell-type frequencies, and firm pressure for high, diaphragm-type frequencies. Featuring a bi-lumen (dual channel) headset design for improved stereo separation, the Adscope 600 offers outstanding performance, comfort, and durability. Your Adscope 600 comes with a scope ID tag and two additional pairs of Adsoft Plus eartips in a convenient storage case. 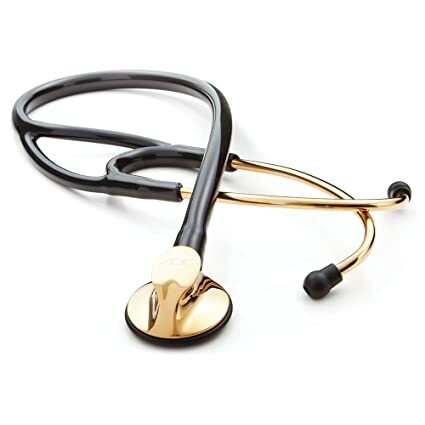 Select from three metal finishes stainless, tactical, or titanium gold plated and up to nine tubing colors, depending on the finish. The adscope 601MRS, our conversable scope that combines the versatility of our legendary sprague with the acoustic excellence of our 602. 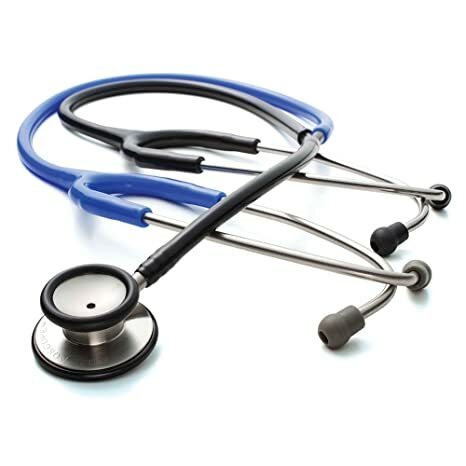 Chest piece precisely CNC machines to exact tolerances from surgical stainless steel for outstanding performance and rugged durability. The adscope 601 metallic Caribbean is our convertible scope that combines the versatility of our legendary sprague with the acoustic excellence of our 602. Threaded chestpiece drum allows rapid conversion from a pediatric diaphram to an adult bell. The 613bkrb adscope teaching sthescope allows the student and instructor to listen simultaneously. The adscope 600 metallic Caribbean features a multifrequency gasketed diaphram that combines the acoustic response of a traditional bell and diaphram into a convenient one-sided chestpiece.